Railpictures.ca - sdfourty Photo: VIA Power Cab #153 ( United Aircraft / MLW 1967 * ) is in charge of VIA train #61 a k a Turbo ( UACL / MLW 1967 * ), three train sets, was a regular sight on VIA trains #60, 61, 66, 67 twenty four trips per week. Replaced in 1982 by the LRC 6900 series locomotives and 3300 series LRC coaches…such is progress. see the future now past – from 1978 perspective: the future November 4, 1978 at Newtonville Road bridge, CN Belleville Sub mile 280.6, on Kodachrome 64 film transported by a **Nikkormat EL, photo by S.Danko ( * THAT is a unique Builder combination) ( ** the EL is in service today, reserved for the occasional excursion….try that forty years from now with one of today’s fancy di-gi-tal’s ! ) ( this is an experimental K64 slide, taken with a newly acquired used Nikkor 28mm F2.8 lens, a true, fast wide angle lens – had to wait two weeks for the K64′s return to see the outcome) What’s Turbo Interesting – a nice break from the constant parade of FP9A’s and FPA4′s ( ! ! ) 1977: Montreal to Toronto 335 miles, two scheduled stops, 4 hours 10 minutes Central to Union 1977: average speed 80.3 m.p.h. On jointed rail. By 1980: Turbo slowed to 4 hours 30 minutes with three scheduled stops. October 31, 1982: all Turbo’s retired. More: Cherry Street Scarborough Jct Scarborough – two track – Hill sdfourty | Railpictures.ca – Canadian Railway Photography – photographie ferroviaire Canadienne. 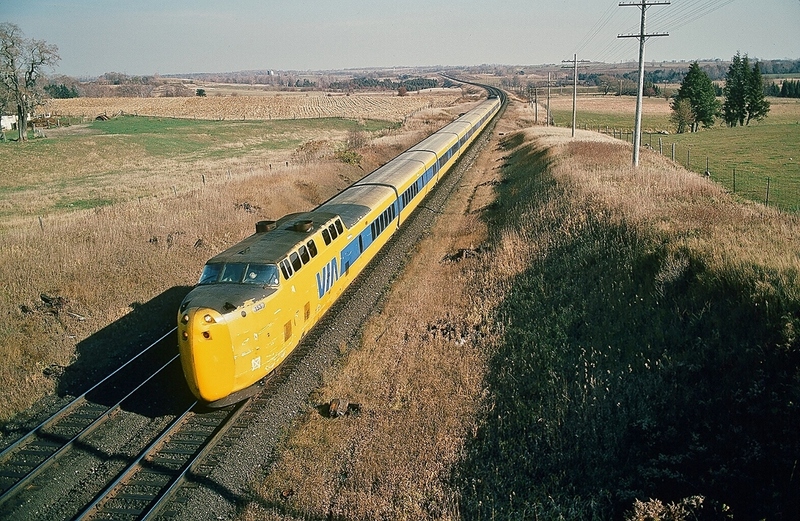 a k a Turbo ( UACL / MLW 1967 * ), three train sets, was a regular sight on VIA trains #60, 61, 66, 67 twenty four trips per week. Replaced in 1982 by the LRC 6900 series locomotives and 3300 series LRC coaches...such is progress. 1977: average speed 80.3 m.p.h. On jointed rail. By 1980: Turbo slowed to 4 hours 30 minutes with three scheduled stops. October 31, 1982: all Turbo's retired. A great time machine effort! Well done Steve!